His power: His power resides in his suit. Extremely intelligent, Stark built a metal suit that gives him super-strength, the ability to fly, and has the power to generate concussive force blasts from his hands and chest. It also contains various explosives and artillery that he can deploy, should the need arise (which it often does). His story: His first appearance is an origin story in the first Iron Man (2008), where his kidnapping and injury lead him to create a reactor that keeps him alive and powers the suit. From there, he continued to fight against villains trying to kill him and/or various members of the public—specifically, Ivan Vanko in Iron Man 2 (2010) and Aldrich Killian in Iron Man 3 (2013). He also slowly develops a serious relationship with his assistant-turned-CEO of Stark Industries, Pepper Potts. In The Avengers, Stark helps to save the world from an invading alien army led by Loki, and in Avengers: Age Of Ultron, Stark helps to destroy a malevolent AI he unintentionally created, one he worked on after the events of the previous film left him feeling the need to create a greater safety net for the world. His last appearance was in Captain America: Civil War, where he drew up the Sokovia Accords, which place the Avengers under the control of the United Nations—a decision that fractured his friendship with Captain America. 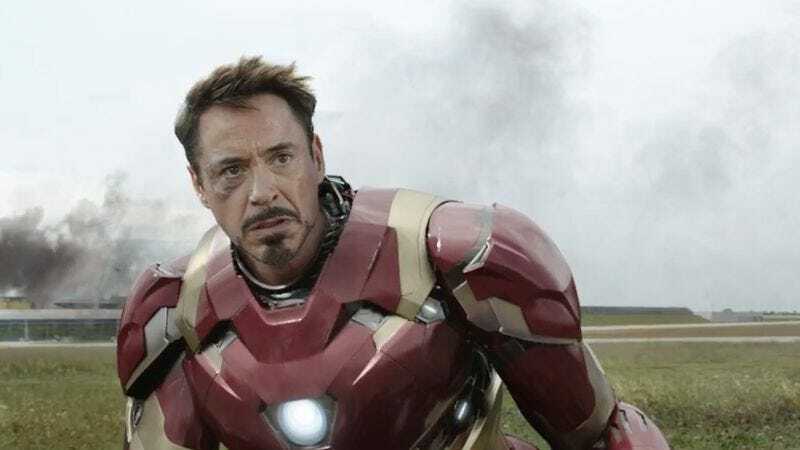 Currently, Iron Man is: Semi-retired, having left full-time Avengers work but still occasionally throwing on the suit to try and do some good. Where will we see him next? In the upcoming Spider-Man: Homecoming, due July 5, 2017.